"That's very much the American mentality: if we can't create it, we can assume it, because at the end of the day, it's all about money." In the annals of failed sports leagues, one of the more disappointing failures was that of the North American Soccer League (NASL). Its attempt to bring the beautiful game to the masses in America almost took hold, before flaming out in a largely self-induced demise. But, for a few years at least, the sport, long derided in America for a variety of reasons, grabbed a small part of the public consciousness. That it did was due in large part to the New York Cosmos, a team owned by Warner Communications, and run by its executive, Steve Ross. His adoption of the game was motivated as much by the money he saw in it as it was by love of the sport, and his attempts to build a flagship club led to the league's expansion and ultimate death. 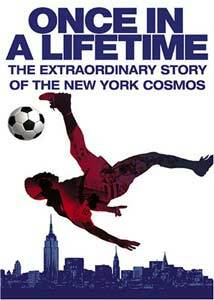 In the 2006 documentary Once in a Lifetime: The Extraordinary Story of the New York Cosmos, directors Paul Crowder and John Dower look at the story of the Cosmos, unsurprisingly littered with egomaniacs, sexcapades, partying, backstabbing, and other fun topics. The NASL started in 1968, the result of a merger between two competing leagues. The league suffered from small attendances for several years, until Ross decided to boost the Cosmos' profile by making a big name signing. He aimed for the biggest of all, the world's best known player, Pel�. The Brazilian legend had just retired from his club team Santos, but when he was flashed a wad of money by Ross and company, he quickly came back to join the Cosmos. The arrival of a world star energized the media and league, with Cosmos attendances growing as a consequence. Soccer not being a one man game, however, led Ross to look for another star, this time signing striker Giorgio Chinaglia from Italy, where he had worn out his welcome. The combination of the two, joined by legends like Franz Beckenbauer and Carlos Alberto, brought the Cosmos four championships in seven years (only the first included Pele, who retired for good after the 1977 season). Crowder and Dower structure their film as a free-wheeling tour through soccer's reception in America, the genesis of the Cosmos, the resultant mania over the arrival of Pele, and the team's subsequent rise and fall. It's all quite entertaining, with the interviewees all opinionated and fairly blunt in their assessments of that period. Most amusing is the general scorn for Chinaglia, who, while a potent goal scorer, was also an egomaniac. Chinaglia blows off criticism of his behavior with a laugh, but it's hard to find the guy admirable as presented here. Pel� has been cashing in for years through various advertising gigs, and wanted a ridiculous amount of money for an interview (I've seen quotes of $100,000 and $150,000), so his absence is the only drawback; it's hard to see him being as blunt as the rest of the cast, however. The directors wrap the film up with a rundown of the participants and their current doings; in a nicely snarky touch, Pel�'s current whereabouts are given as "Declined to be Interviewed," punctuated with the sound of a cash register. Plenty of game footage is on hand, dating back to the earliest days of the team, and the soundtrack is filled with quality tunes. The directors don't shy away from presenting multiple interviewees giving completely different versions of the same story, but some shaping of the tale to fit their viewpoint is unavoidable, with some particpants coming off better than others. Nevertheless, this film makes for an amusing summary of soccer's first golden age, if you can even call it that, in the United States. Major League Soccer, which began in 1996, seems to have learned from the NASL; expensive foreign players are non-existent (not that they'd come anyway), as American talent is developed, and the league is approaching expansion carefully. The league also has a solid presence on TV, something the NASL couldn't hold onto. With several World Cups having been seen since the demise of the NASL, viewers have had time to grow accustomed to soccer's no-stoppage format, something in stark contrast to the constant stop-start of American team sports. Soccer remains a niche sport, but it's there, and if that presence is owed in some small part to the New York Cosmos and their moment in the spotlight, then it's a story worth remembering for soccer fans. Image Transfer Review: Generally a clean image, presented in anamoprhic widescreen, though some of the older footage obviously shows its limitations. Easy to read English, Spanish, and French subtitles are available. Audio Transfer Review: The 5.1 surround mix makes decent enough use of the rear speakers, usually for music, and occasionally for what sounded like phony crowd noise and the like during game clips. Otherwise this was a solid track. Extras Review: A nice array of stuff here; the first two items focus on Pel�. The first is excerpts (00h:11m:04s) from ESPN's Sportscentury Pel� episode, with speakers such as Bobby Charlton, Chinaglia, Cosmos goalkeeper Shep Messing and others, all rhapsodizing about the Brazilian star. Next up are three condensations of ABC Wide World of Sports presentations. The first is coverage of Pel�'s retirement game (00h:22m:31s), which pitted the Cosmos against Pel�'s previous club team, the Brazilian club Santos. The segment features pre-game and post-game coverage in addition to match highlights; Pel� played one half for each team and was almost unable to speak during a post-match interview, as he was overcome with emotion. Two of the Cosmos' appearances in the appallingly-named Soccer Bowl feature in the next extras. Comprised of edited highlights from each game, these ABC broadcasts include the original commentary, though the choice of highlights doesn't always make sense; in the 1980 game (00h:18m:55s), the Cosmos' first goal is skipped over, and we only see it in a replay later in the game. In any event, both game provide a good overview of the team in action, with the 1980 game an easy 3-0 win with Chinaglia scoring twice. The 1981 game (00h:24m:15s) saw the Cosmos lose in a shootout, the NASL's version of the penalty shot, a more interesting variant of that game settling format. The players all praise the format in the documentary, preferring it to the regular format. Neither format is ideal, but kudos to the NASL for trying something different. There is also one deleted scene (00h:04m:10s) detailing the seat-of-the-pants type business the Cosmos did, in which a tournament hosted by the Cosmos went awry, and the lengths the team went to in order to make it look like nothing was wrong. Amusing but inessential. No doubt there were plenty more stories like it. Once in a Lifetime tells a story about the US sports scene that most will not be aware of. The directors never take the material too seriously, and it results in a rollicking tale that gives virtually all the major players their say, often disagreeing along the way. The DVD throws in some quality extras to go with a solid presentation.